Luxury Camping at La Plage et le Bord de mer camping site. 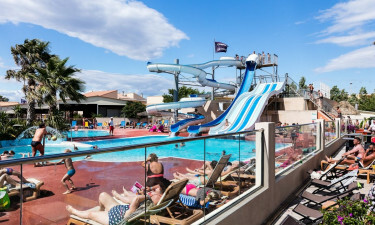 La Plage et le Bord de mer is a popular family holiday resort, perched on the Mediterranean sea in the lazy Languedoc region. With direct access to a stretch of sandy beach and excellent water-inspired features of its own, this lively destination has everything to offer when it comes to camping luxury. Availability of mobile home accommodation and information on how to book yours can be had from LUX-camp, so make that call today. Welcome to La Plage et le Bord de mer luxury camping site. What's special about La Plage et le Bord de mer luxury camping? Elaborate and extensive water park for all the family to enjoy. Surrounded by many beauty hotspots. Direct access to golden sandy beach. When you come out of your luxury mobile home, you'll want to head to the site's superb swimming complex straight away. There are 4 Pentogliss tracks, 1 Kamikaze ride and 1 Space-Slide. This elaborate mix of twisted chutes and slides also has a spa which includes a whirlpool and hot tub. There's even a paddling pool for the little ones. The site runs an aqua gym and lots of other games to keep the family entertained, while you soak up the sun rays from your terraced deckchair. 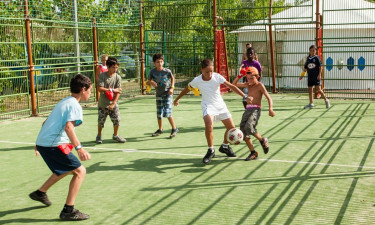 Your camping holiday includes a wide variety of activities to choose from; mini-golf, tennis, multi-sports ground, football, basketball and volleyball facilities. Further afield you can get busy with some jet skiing, diving, kayaking, fishing and there's a golf range too. If you feel inclined, why not drop into the equestrian centre and take a ride around the beautiful surrounding countryside. There's also two children's clubs onsite; 4 - 10 year old's and something else for the teens. The Languedoc region is popular with tourists because of its twin aspects of lush landscapes and the blue Mediterranean horizons. The Languedoc enjoys sunny climes for most of the year and attracts families who enjoy sun, sea and sand. The surrounding countryside is naturally unspoiled and is carved throughout with charming walking and cycling trails. The local villages and towns are typically rich with French heritage sites, historical landmarks, culture, arts and fine cuisine, making them perfect for day trips. 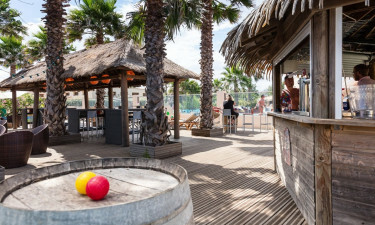 There's a great choice of eateries in this delightful resort including a restaurant, take-away service, ice-cream venue, snack bar and a full bar where you can sip on a chilled glass of local vino - what better way to spend an evening? You can dine al fresco or indoors for your convenience. La Plage et le Bord de mer has a souvenir/bazaar shop, a newsagents if you want to catch up on news back home, as well as a bakery/cake shop that sells delicious fresh bread and pastries daily. There's also a mini-market where you can stock up on many essential grocery items.